My second race this year, and my first 10K race. Nike organizes a lot of races for women around the world and I have heard good things about them, so I was very much looking forward to this race. 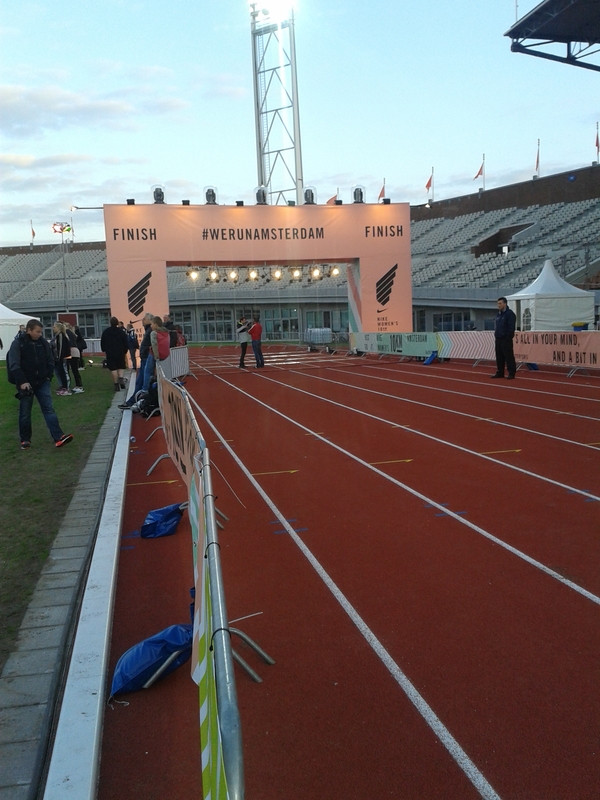 Before the race I had to go pick up my race pack in Amsterdam (there was only one running store where you could pick it up), so on a sunny weekday afternoon I decided to go. It wasn’t very difficult to spot the running store because there was a queue of girls waiting outside. This was the first time I ever really had to wait in line to pick up my race pack. When I got to the front of the queue the “bouncer” asked me how long I had been waiting for, which was around 20 minutes. He told me that wasn’t that long, because the previous day there was a line of at least 45 minutes! After picking up the race pack with the t-shirt, wristband and timing chip I went home again. The race took place on a Saturday evening and I arrived at the old olympic stadium at around 20.15. I’ve heard good things about Nike races, especially about the organization. I was happy to find that there were lockers available (when you paid 5 euros) to store some clothes and belongings in. There was also a stand with Nike clothes (obviously), and you could get your make-up and hair done, although that looked a bit over the top to me. Personally, I missed the ‘names sign’, I’ve seen pictures on the internet of Nike races where they have this huge sign with all the names of the participants and you can try to find your own. I think that would have been a nice touch, but no such luck today. There was a warming up inside the stadium after which each of the six pace groups was lead outside one by one by their pacers. By then it was already 21.00, which was supposed to be the starting time of the race. It took a while for everyone to get out of the stadium and by the time I crossed the starting line it was around 21.25. I was off to a pretty good start and I passed a few pacers (my first running interval is always the fastest). The atmosphere was great, the other runners were very nice to one another (encouragements and no pushing other runners) and so where the marshals and supports! Slowly it became dark while we were running to the centre of Amsterdam, through the Vondelpark, underneath the Rijksmuseum en back through the Vondelpark. A fantastic course in a great city. The locals seemed somewhat surprised to see 6000 women running through their streets, but they cheered us on none the less. More and more pacers started to pass me by, and I was waiting for the 80 min pacers to catch up with me, but it wasn’t until 70 minutes into the race that I finally saw them come up behind me. I was very surprised they didn’t catch up with me earlier in the race. I managed to stay ahead of them for a little while, but by the last km I was running out of energy. While I came into the stadium (about 200 meters to go) more pacers came towards us to help us reach the finish line. In the end I finished in 83 minutes. Not a bad time for my first 10 k. And when you cross the finish line you get a bracelet instead of a medal, a quite neutral bracelet which you could also wear in your day-to-day life, which was a nice touch. A great course and great volunteers, I would definitely recommend this race. However, the only thing I’m disappointed about are the race photos. I’d seen multiple photographers along the course and I was hoping to get at least one good race photo (I never seem to manage to look good in race photos). I’m pretty sure the photographers must have made hundreds of photographs that evening, but Nike only published a few on their Facebook page. Just 10 actually. Don’t get me wrong, I understand that not all photos will be suitable for promotional purposes and that not all photos can be put on a Facebook page, but why not make a page and put all photos on there so the participants can see if they can find any photos of themselves? Instead we got a “personalized” video, which sounds great, but in reality it was a general 30 second clip with one very blurry picture of me which seemed cropped from a larger image. Such a shame, I had hoped for something better. But would I enter into this race again next year? Definitely!